Sacerdotus: Pope Francis Got Pissed Off! Pope Francis has made it his mission to be compassionate, loving and merciful, but he is also human and has emotions. Today a group of fanatical faithful yanked on the Pope's sleeve causing him to lean in onto a disabled man/child in a wheelchair. The Pope visible angry with face red shouted, "eso no se hace, no seas egoista" (You don't do that, Don't be egotistical). 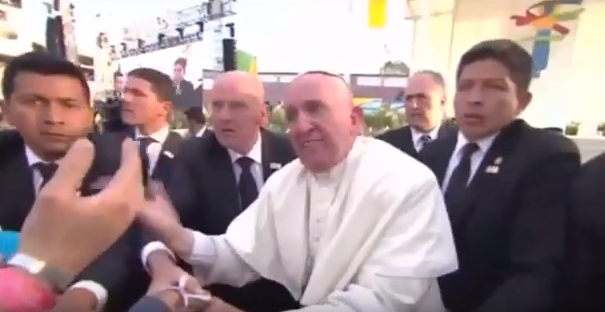 This was the first time I have seen Pope Francis or any Pope visible angry in such a manner. While we must be humble, compassionate etc, we also must be alert and call out wrong doing even with anger. The Pope was 100% correct. He could have gotten hurt and could have seriously hurt the disabled person in the wheel chair. There is no need to pull on the Pope or anyone for that matter. It is dangerous, especially for an elderly man - elderly men - who have problems with balance as it. Even a man of my age will fall if someone or a group yanks on my sleeve. I have always had issue with how people get when the Pope visits. It is like they become animals running on instinct. I remember at World Youth day this man pushing people on the crowd including myself. I had a cassock on and shoved the man back and yelled at him telling him that he is going to hurt someone to relax or I was going to get security. People should relax and not get carried away in the presence of a Pope or anyone else. Someone could get hurt if fanaticism takes over and crowds become like hordes of zombies trampling over one another.